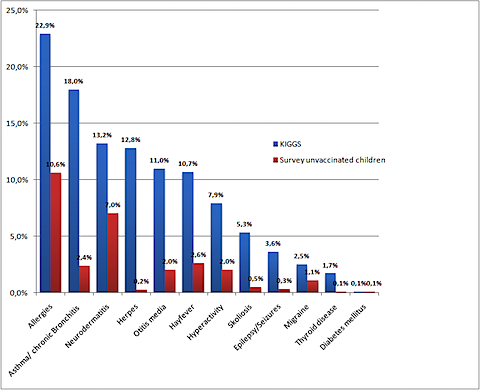 The data was collected from parents with vaccine-free children via an internet questionnaire by vaccineinjury.info and Andreas Bachmair, a German classical homeopathic practitioner. The website is not a pretty one (including Google ads for vaccines) but the actual data is what counts. The independent study is self-funded and is not sponsored by a large "credible" non-profit or government health organization with political and financial conflicts of interest. Each one of the 8000 cases are actual cases with medical documentation. Three other studies had similar results according to Bachmair and are reported below. This page contains a single entry by Archimede published on March 18, 2015 6:45 PM. Women In The Know Refuse Mammograms was the previous entry in this blog. Vatican: UNICEF and WHO are sterilizing girls through vaccines is the next entry in this blog.